What is sokumen awase uke?2 There are 2 kinds: both utilise similar body mechanics, but result in a different deflection. The first of these is the inside sokumen awase uke. It is performed by using your palm and forearm to catch an incoming punch, the guide it past your head as you move on the inside of your opponent. The "matching" occurs insofar as you go out to meet the attack, match its speed and redirect it past. The pictures to the right illustrate this technique. This inside sokumen awase uke occurs, I believe, in the kata sanseiru. However in most schools this technique now appears as a "jodan uke" (ie. an age uke or rising block). Consider for example the photograph on the left of Chinen Teruo Sensei performing sanseiru kata: note the positioning of his body and the angle of the forearm which is in contrast to the usual angle of age uke away from the face. For the reasons detailed in my article Sanseiru kata and its variations: Part 2, I don't believe the jodan uke is consistent with the body mechanics of the particular kata movement. When used in the above movement in sanseiru, the inside sokumen awase avoids the problems inherent in trying to use a jodan uke or age uke because the angle of the forearm must slope past the head; the whole idea of the block is to match the attack and carry it to one side (where the deflection concept in the age uke is quite different). The interception on the inside sokumen awase occurs with your palm which in turn transfers the attack to your forearm as you brush it past your head. Your elbow is then put into a position where you can effect an empi uchi (elbow strike). As I mentioned at the outset, the outside sokumen awase uke has similar body mechanics, but the deflection utilises the back of the palm and forearm, not the front. In effect the attack is intercepted with a "steeple" block, then passed down to the "turtle" or "shield" position that one sees in MMA today. As with the the outside sokumen awase uke (perhaps more so) the block takes you into an elbow strike. The pictures to the left illustrate this concept. In either case, the technique sets you up nicely for performing a footsweep (see the pictures on the left). In our school we tend to evidence this in our performance of sanseiru kata rather than the inside version. We also practise this move in the kata kururunfa (as do, I believe, most goju schools) - see the picture to the right of Higaonna Morio Sensei demonstrating the outside sokumen awase uke ending with an empi uchi in kururunfa. There is yet another "sokumen awase" block in karate that I feel has been "forgotten". For the sake of convenience I have referred to it as "sokumen te awase uke" - since it involves more of the palm and less of the forearm. I considered calling it "sokumen nagashi uke" however I use "nagashi" for different purposes (sweeping sideways). Once again, there are 2 verisons; an inside version and an outside version. Here is a video about these techniques. Sorry about the sound quality - but I filmed it mid-way through a lesson. The rest of the class were busy on bunkai of other kata. In relation to the seiyunchin version, note carefully the lifted front foot: this functions to put immediate pressure on the opponent. Given that the tenshin (evasion) or taisabaki (body movement) is directly in towards your opponent you have to be quick. Lifting the front foot and letting your weight fall forwards is the quickest way to put pressure on the opponent. The deflection utilises an "upward circle", and the lifted foot helps this aspect as well. In this respect the kata is very xingyi-like; xingyi uses upward and downward circles to deflect while it moves forwards and backwards in a linear path. There are many examples of this kind of upward or downward deflection in seiyunchin prompting me to wonder whether seiyunchin is not influenced/partly descended from xingyiquan (despite its shikos etc.). In the series of photographs above I demonstrate the inside sokumen te awase uke as used in the Tang Shou Dao form Da Peng Zhan Chi. 1. This is a combination of 2 articles I wrote last year. I have combined and updated them in light of my recent post "Forgotten" techniques #1: haiwan nagashi and ashibo kake. 2. It is important to note that I use the term "sokumen awase uke" differently from other (usually shorin-based) karateka. I use it to describe the deflections discussed in my previous post relating to the variations in sanseiru. 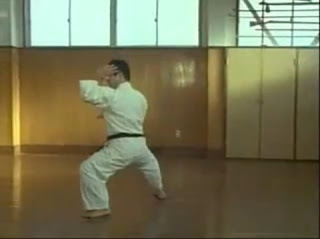 Usually in (shorin) karate the term is (I think erroneously) used to describe a 2 handed circular block.Consider these screen captures of Kanazawa sensei performing the block usually referred to by that name in the kata bassai dai. Essentially it is a 2 handed block that moves up to the side of the head. Most definitions of the term focus on the "2 handed" aspect, which I feel is misconceived. "Sokumen" is, of course, the side of the head. "Awase" comes from the verb "awaseru" which, in turn, comes from the verb "au" (all of which use the same character as "ai" in "aikido" ). "Awaseru" basically means "to match up with " and "awase" is basically its noun form. Accordingly "awase" carries the connotation of matching one's movements up with someone else's. In the case of the deflections I refer to in my video, your hand moves out to match the opponent's attack, then carry it slightly off to one side. I suppose the justification for the "standard" use of the term "sokumen awase" to refer to 2 handed blocks is because both hands match each other, but to my mind such a technique is best described in terms of "morote" (augmented) or some other reference to "double". Certainly "awase", as a martial concept, is known to refer to "matching with an opponent" - especially in arts such as aikido.